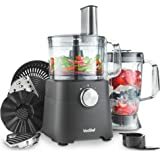 Amazon's Choice for "kitchenaid attachments"
Sold by Hippie Bags and sent from Amazon Fulfillment. 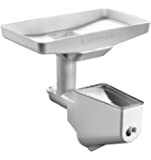 The sausage stuffer must be used with the Food Grinder (5FGA) to make delicious sausages. Choose the appropriate tube to get smaller or bigger sausages. 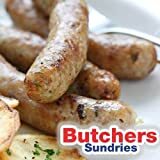 Select the ingredients, connect the attachment and let it do the rest: surprise your guests with tasty yet super fresh sausages. Add any flavour you prefer to give it that extra special taste and enjoy the ultimate genuine streetfood. 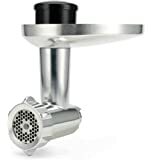 Use this sausage stuffer in combination with the food grinder (5FGA). 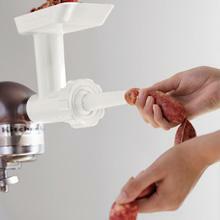 It will let you easily create home-made sausages out of fresh and genuine meat. 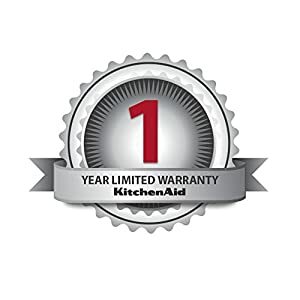 Designed exclusively for use with KitchenAid Stand Mixers. 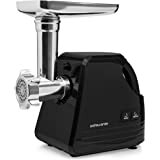 Use Sausage Stuffer (5SSA) with Food Grinder (5FGA). 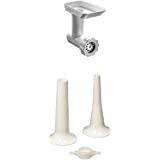 Use the small Sausage Stuffer tube to make breakfast sausage with casings and the large Sausage Stuffer tube to prepare Bratwurst, Italian or Polish sausage with casings or breakfast sausage without casings. 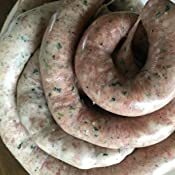 To form smaller links, lay the entire length of sausage on a flat surface and twist filled casing several times at regular intervals. Fresh sausage may be stored 1 to 2 days in the refrigerator or up to 1 month in the freezer. First completely disassemble sausage stuffer attachment. 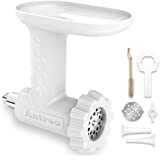 The following parts are dishwasher safe: Retainer bar, Sausage Stuffer tubes, Grinder body, Grinder worm, Ring, Combination food pusher/wrench. 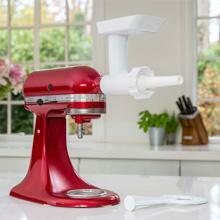 Turn Stand Mixer speed control to '0' (Off). 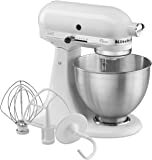 Unplug mixer or disconnect power. 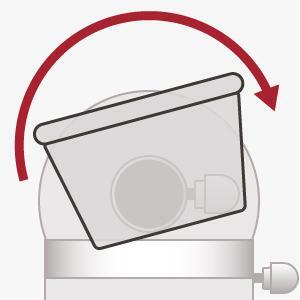 Depending on which type of hub you have, either flip up hinged cover or loosen the attachment knob by turning it counterclockwise and remove attachment hub cover. Insert the attachment shaft housing into the attachment hub making certain that attachment power shaft fits into square hub socket. 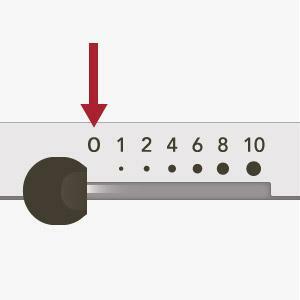 It may be necessary to rotate the attachment back and forth. 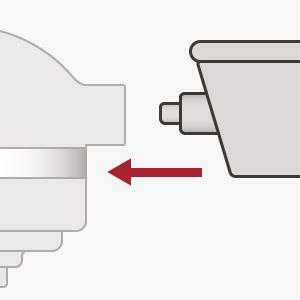 When the attachment is in proper position, the pin on the attachment housing will fit into the notch on the hub rim. 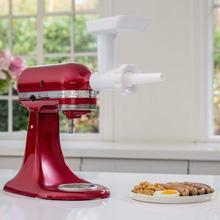 Tighten the attachment knob by turning it clockwise until the attachment is completely secured to mixer. 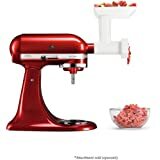 My wife bought me this with the sausage stuffing attachment including the mincer for Christmas. 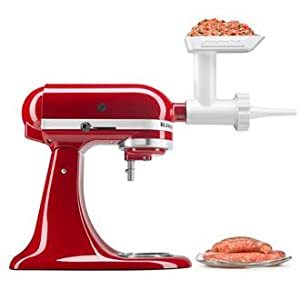 I make homemade sausages 10lb at a time and use a traditional hand cranked mincer to mince the meat and then add a sausage nozzle to stuff the sausages. Today I had a batch of pork already minced so once I added the seasoning etc I set up The Kitchen Aid (KA) for stuffing. The tray / hopper is pathetic and ridiculously small, the feeder hole is too narrow to get any quantity of meat down, the screw and the bore of the main body is very narrow and again no real volume of meat is pushed through it after about two minutes I still had not stuffed enough for one sausage and gave up and finished of using my manual equipment. You physically can't get enough meat down the feed tube and through the screw section to do any realistic stuffing. This product is not fit for purpose: I compared individual parts with my hand mincer (HM), apart for the fact the hand mincer is made from solid metal the screw and the bore of the HM is twice that of the KA one this means the HM passes down 4 times the volume than the KA. The mincing plates on the HM are 3 to 4 times the thickness of the KA ones and the HM blade is cast and the blade is ground sharp, the KA blade is a flimsy thin stainless steel propeller with no edge. I have not used or would even contemplate using the KA for mincing meat, there is just not enough time in the day. This piece of kit is heading for the dump as I cannot honestly resell it or even give it away. If I could give it zero stars I would this, is definitely an example of design over function. Worth having for fun in the kitchen. Takes a while to get the quantity right in the casings. Don't put too much in so you can twist it. You are supposed to twist one way for one and then the other way for the next but that is a skill to learn in itself. But the sausages are great. well worth the effort. I have looked at all the other ones and i am so glad i went for this one. Easy to install with instructions and can wash in dishwasher(some cant). 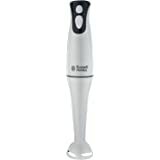 Reasonably priced product provides great fun in making your own sausages, would recommend anyone to have a go at this.